Federal Reserve Chairman Ben Bernanke told Congress on Wednesday that the outlook for the economy remains "unusually uncertain" but that the Fed plans no specific steps "in the near term" to try to fuel the struggling recovery. Instead, Bernanke said the Fed would monitor the strength of the recovery and consider action if matters worsen. His comments to the Senate Banking Committee sent stocks tumbling downward. The Dow Jones industrial average had been up 20 points before he spoke. It fell as much as 160 points during his testimony, but recovered some losses to close down 109 points. Investors shifted money into the safety of Treasury bonds; the yield on 10-year Treasury notes fell to 2.86 percent. "If the recovery seems to be faltering, we have to at least review our options," Bernanke told lawmakers. But he said no further action is planned for now because the economy is still growing. 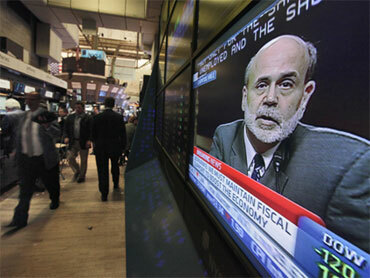 Record low interest rates are still needed to bolster the economy, Bernanke said. He repeated a pledge to keep them there for an "extended period." "In short, it look likes our economy is in need of additional help," said the committee's chairman, Sen. Chris Dodd, D-Conn.
Sen. Richard Shelby of Alabama, the highest-ranking Republican on the panel, said the economic outlook has become a "bit more cloudy." Bernanke downplayed the odds that the economy will slide back into a "double-dip" recession. But he acknowledged the recovery is fragile. Bernanke is trying to send a positive message that the recovery will last in the face of growing threats. At the same time, he wants to assure Americans that the Fed will take new stimulative actions if necessary. With little appetite in Congress to provide a major new stimulus package, more pressure falls on Bernanke to keep the recovery going. Bernanke and his Fed colleagues have cut their forecasts for growth this year.